There is a new book published on the Church Fathers written by a self-professed “proud, dispensational, conservative, born-again fundie.” He is from Moody Bible Institute. 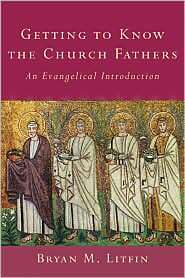 I ordered a copy of Getting to Know the Church Fathers by Bryan Litfin. Below is an excerpt from an interview he gave with Susan Wunderink for Christianity Today. 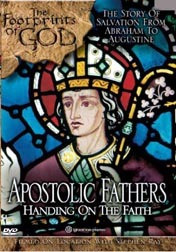 Having just produced the only documentary in existence on the Apostolic Fathers (the earliest of the Church Fathers), I read the interview with curiosity. You can read the whole interview for yourself, but here are a few things I found revealing. Litfin wrote: Whom did you write the book for? Someone like me, someone who had heard of the concept of the ancient church and thought Yeah, there were people in togas who got thrown to the lions. But I didn't really know who they were, and I certainly didn't feel any spiritual or theological connection to them. Then I began to see them as real people. I began to see them as my forefathers, that I might feel an organic connection. And that church history is a continuous story.We can recover the fathers as our own and we can recover them through a direct line back, so that all the richness of church history becomes ours. That's what I want to do for the Christian today: I want the Christian to understand that there's a richness to their history that they're missing; embrace it and let it be something that inspires you. So far so good. This was the exact sentiment I had when I began to read them—thinking that I would discover fellow Evangelicals who held to the simply “Bible Alone” and “Faith Alone” theology of “real Christianity.” If found differently. I find it sad and disappointing that contemporary Christians have avoided and ignored this period of the Church. The first two centuries were the hinge between Jesus and the Apostles and the Church today. Why do many consider their favorite Televangelists, pastors and writers to be so influential today, but they ignore the first Bible teachers and pastors—the ones who knew the Apostles personally? I commend Litfin for writing this book. But now let’s see his basic conclusions and what he avoids. Are there some negative views evangelicals hold that are valid? Yes. I try not to go into that too much, not in order to hide those things but because they're so complicated. It just opens up a can of worms. I feel that perhaps the pendulum is so against them that I need to be positive to counter-weight that. You have to realize that they're not evangelicals. So some of the points where we would differ with them would be the points where we would differ with Roman Catholicism. Some of their doctrine of salvation is going to be sacramental. They're not going to use the term inerrancy, but they give full credence to Scripture, and [see it as] inspired. Their anti-Semitism is something you can put in there as needing correction. There can be a works-orientedness to them, where there's a paying-off of God. You can see that in Tertullian, for example. Yes, he has to ignore and avoid their basic theology and teaching on salvation because it is too sacramental, too Catholic. He wants his readers to know these first Christians, but not to really know them. Let’s find what they believed that agrees with us (the final judges) and ignore the part that sounds too Catholic. His admission that “You have to realize that they’re not evangelicals” is very revealing. What he is really saying is that he has a different religion today than the first Christians held in the first centuries. Who has the true theology and practice—those 2,000 years removed or the ones who learned the faith directly from the Apostles? Hum! Who should be listened to with more credence? 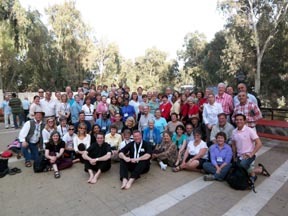 An admitted 21 century “fundie” or the martyrs who learned at the feet of the Apostles John, Peter and Paul? I know at whose feet I will sit to learn. Litfin says that their theology is too complicated. No, actually it is very simple, Lutfin just disagrees with it. It is only complicated for Litfin and Evangelicals because it contradicts their new Protestant religion. It scares them. Litfin says that to discuss their theology opens a can of worms. Yes it would! And for those who dare to open the can of worms very often see the poverty of their modern Evangelicalism. Modern Protestantism is very different from the early Christians. Those who begin to dig deeper frequently become Catholics. It is a dangerous thing for modern Evangelicals to encourage their followers to read the Fathers since they will soon lose many of the best and brightest to the Catholic Church. I don’t think this will be a big trend, it is far to dangerous to encourage the reading of such subversive literature.